The Night's Watch. No Leal. Character. Coste: 5. FUE: 5. 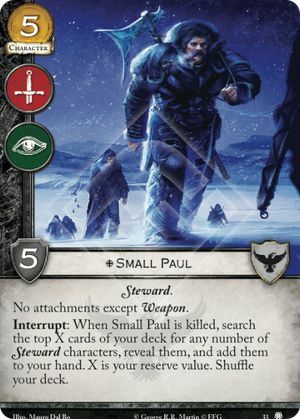 Interrupt: When Small Paul is killed, search the top X cards of your deck for any number of Steward characters, reveal them, and add them to your hand. X is your reserve value. Shuffle your deck.